the Grandmother Drum is heading to the Gold Coast this weekend for 3 days of performance, workshop and healing sessions. Regards, Ken Jacob World Music Promotions. From a vision of indigenous grandmothers and many hands of the multicultural Alaskan community, the GrandMother Drum (the largest drum of its kind in the world), took over a year to construct. White Eagle Medicine Woman guided each step of the Building Ceremony of the GrandMother Drum with prayer, ceremony and world-wide meditations. 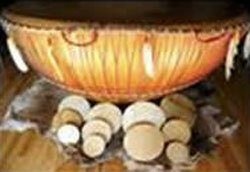 Each of the seven layers of wood of this 7 foot (2.134m) diameter drum, represents the 7 continents of Mother Earth. Over 1300 strips of Alaska Yellow and Red Cedar and Alaska Birch were used for the kettle shaped drum base. During each layer, prayers and ceremonies were conducted for the people of each continent of Mother Earth. The GrandMother Drum design brings together the drums of the people of the four directions. The drum’s kettle shape design is similar to the kultxrun of the Mapuche of South America, the Buffalo skin came from North America, the stringed tuning style is that of an African Djembe and the stand reflects an Indian tabla. Over two hundred clear and rose quartz crystals are embedded in the kettle shaped drum base. The crystals were embedded in a pattern known as the Sacred Triple Spiral. This pattern is actually a matrix of the chakras or energy centres of the human energy field. 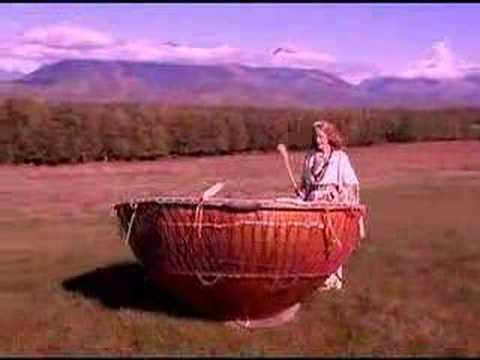 When activated through specific drumming techniques, the crystals in the Grandmother Drum transmit a high frequency healing tone, immersing the human body in a high crystalline environment, raising the potential for a deep healing of the physical, mental, emotional and spiritual bodies. The Mission of the GrandMother Drum International Peace Project is to travel around the world promoting peace and unity through the global language of music, dance, cultural and healings arts. 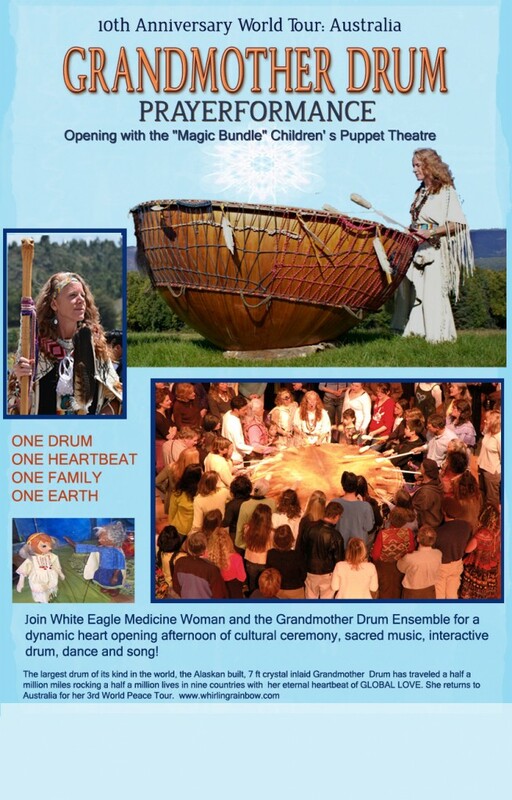 The performances are interactive, tribal with ceremonial flare… GrandMother Drum Projects dynamic “prayerformances” transform the hearts of all involved, leading audiences in a passionate fury of love. White Eagle Medicine Woman will take you on a journey that is older than time itself, a story that begins east of the sun and west of the moon. In this fun and interactive story, you will meet GrandMother Sees the Truth and the Great White Elder and find out whats inside the magic bundle they left for us all. This teaching story shares the heart of the Grandmother Drum Project, the unity and oneness of the human family. This program culminates in the children joining White Eagle on GrandMother Drum for an interactive drum and dance spectacular. There will be healthy snacks and drinks available to purchase. On Sunday 15th April we are having a drum making ceremonial workshop “THE HEALING POWER OF THE DRUM” facilitated by Suraj Holzworth (White Eagle Medicine Woman) where small replicas of the Grandmother Drum are made. Healing sessions by appointment (1-2hours) available with White Eagle, Salila Hughes, Michaela Baumgartner, or Sri Devi. Evening Group “Spirit Walk” Session with White Eagle and Grandmothers 5-8pm. $44 per person. This entry was posted in Event, Past Event 2012, Percussion and tagged Percussion by kenjacob. Bookmark the permalink.